This Spicy Dill Dip makes a fantastic snack or appetizer. Serve it with pita and veggie dippers as an easy make-ahead after school snack or bring it to your next party or potluck! Combine greek yogurt and sour cream in a medium bowl. Remove the stem and mince your jalapeño. Include all of the seeds for a spicy dip, half for a lightly zesty dip, and no seeds at all for a mild fresh dill dip. Add to the bowl. Grab a 3 inch section of an English cucumber and coarsely grate with a cheese grater. Wring out excess moisture in a paper towel then mince with a chef's knife. Add to the bowl. Stir in dill, green onion, parsley, onion powder, garlic powder, and salt. Cover bowl with plastic wrap and place in the fridge for a minimum of one hour, or simply make it the day before for an extra flavorful dip! Serve with all your favorite dippers and dig in! I love using jalapeño (and it's spicy seeds) to control the spice of this dip. Other fiery add-ins include hot chili sauce (like Sriracha), ground cayenne pepper, and red pepper flakes. Season to taste with any extras of your choosing and taste as you go. 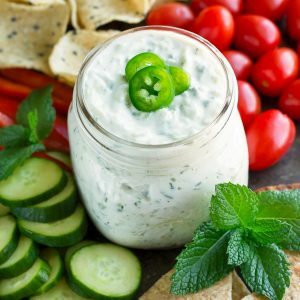 This dip can be made with as little as 1 hour chill time, but for even more flavor try making this dip the night before, letting it chill while you sleep. The spices will mingle with the yogurt and sour cream and it's just plain glorious!